"We have gathered here week after week, sharing a common quest for a deeper faith, and a deeper experience of God's presence. I invite you now to close your eyes and let go of the things that distract and concern you. ................................................................................................................................................Listen, the time is drawing near. Jesus is preparing to enter Jerusalem. How will WE greet him? Will WE follow all the way to the Cross?" Hymn TIS 333 "All glory, praise and honour," A song acknowledging God's kingship over all people, all through history and speaking of the thanks and praise given to Him by all. In Kid's Time out Helen told of how she prepared for visitors and how, as a community, we make special times to celebrate the success of people, lining the street, to wave as the special people drive by. In Jesus' day people would line the street and wave branches and call out. To stop the visitor being splattered with mud the people would lay down their cloaks. HYMN TIS 244 "Trotting through Jerusalem" A hymn revealing how the children greeting Jesus in Jerusalem had the right idea. The adults were expecting someone on a mighty horse to lead them into battle and were amazed to see such a quiet man. However the children saw the essence of Jesus, "Happy is he that comes in the name of the Lord!" Prayer A prayer about the choices that confront us each day, and how some choices lead to light and others to darkness. Helen led the congregation, praying "May we learn from the choices of Jesus and embody compassion, justice, and inclusion in all we say and do. Amen." Scripture Reading Luke 19: 28 - 40 The story of Jesus directing his disciples to borrow a colt and the ride into Jerusalem, with the people lining up to "praise God joyfully with a loud voice for all the deeds of power they had seen." The Pharisees were not happy and told Jesus to tell the people to stop, to which he replied, "I tell you, if these were silent, the stones would shout out." Reflection. Unfortunately, I was unable to attend the service but from Helen's short notes it appears the reflection focussed on the reading, and Jesus' claim to be King. An odd sort of king: an unemployed, homeless Rabbi who showed his authority during the cleansing of the temple but whose followers were a bunch of country bumpkins. The reading shows how the event we remember on Palm Sunday was a deliberately, politically contrived event by Jesus to make His claim as King. This was Jesus making a statement. Later we read of Pilate ask a half dead Jesus, "Are you the king of the Jews?" and later the sign on the Cross: "King of the Jews"
When Jesus entered Jerusalem as King it was not as the King we want. He overturned all our expectations and definitions of God, challenging us to see things in a different way. For myself, I am aware of people, including myself, wanting a God who dispenses with the cruel and nasty people and things on earth. It would be really nice if he would be the God who gets rid of raging ear aches, like the one I have at the moment. 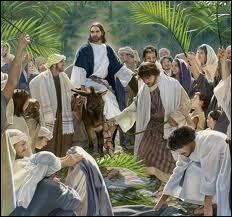 But the message of Palm Sunday and Easter to follow, is that He isn't that sort of King. Prayer. "Lord Jesus, on this Sunday you entered Jerusalem as the king we didn't expect, ruler of a kingdom we found hard to understand. Enter into our city, we pray. Hymn TIS 348 vv1,2,5 "Ride on, ride on in majesty" ..."in lowly pomp ride on to die; bow your meek head to mortal pain, then take, O God, your power and reign!" There followed the Freewill offering and the Prayers for others which included a report by Jack on the Presbytery meeting. Hymn TIS 456 vv1,4 "Your hand, O God has guided" The victory will be won..." and then by all creation, your name shall be adored, and this shall be our anthem: “one church, one faith, one Lord.” Sounds like paradise. “Go in peace to love and serve the Lord. May I wish you all a blessed Easter, including my follower in South Korea and my follower in the Ukraine. Rowena asked for any announcements, an important one relating to the Good Friday service. The bus will not be used, but car transport is availablefor anyone who needs it. Also for the Good Friday and Easter Sunday services, condensed versions of the services have been printed for people who cannot attend. Contact Elaine if you need help with any of these. Rowena then gave the Call to Worship, which was taken from 'Congregations' by retired UCA minister, Bruce Prewer. "They live by faith; congregations of common people." We were called as people brought to life by Jesus' message; people living by hope and love and grace. Hymn TIS 473 "Community of Christ". "...live out your creed and risk your life for God alone...look past the Church's door and see the refugee, the hungry, and the poor." We can hardly do otherwise and still claim to belong to Christ. Prayer of Confession Rowena led us in a prayer to ask God to look on us as we really are, to go past the shell we present to those around us and give us courage to face ourselves with self-honesty, to repent and ask forgiveness. Forgiveness for sins we recognize and those we haven't recognized. Declaration of Forgiveness Rowena followed by assuring us of God's ability to heal and free us, reminding us that He is always available to forgive. Thanks be to God. Hymn TIS 342 "When I survey the wondrous cross" To continue the idea from the last hymn - "...love so amazing, so divine demands my soul, my life, my all." It would be a bit odd, if in the face of the Lord of all emptying himself for us, that we, in response, handed over only a fraction of ourselves - like some sort of tax. This would be a strange response to the gift of such love. Both readings are stories of great extravagant gifts. How extravagant are we in our gift of ourselves to others? I heard someone once describe a gift they were to give as 'adequate'. I think if the intended recipient had heard that said, they might have preferred to have received nothing at all. 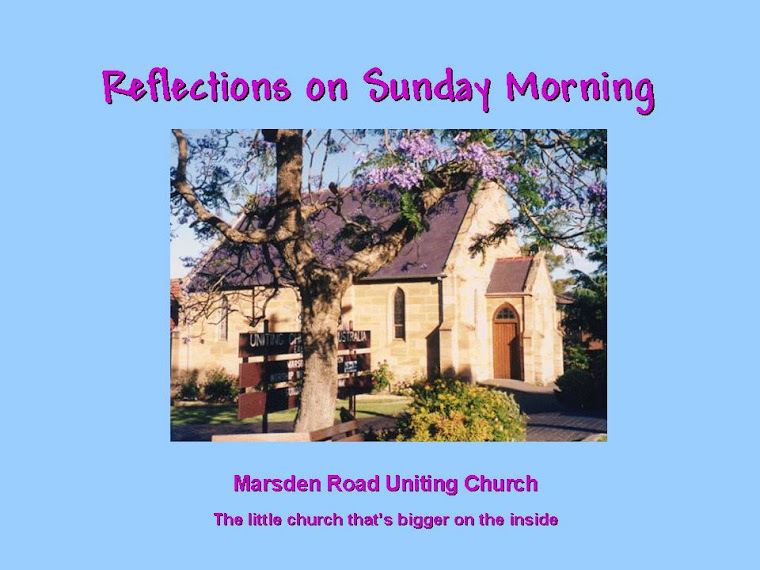 Reflection "Extravagant Love" In speaking to us, Rowena referred to the reading in John where Jesus was at the home of Lazarus' sister for respite from the weight of his work and before he faced the agony of Good Friday and the triumph to follow. It is here that Mary anoints Jesus' feet with costly, perfumed, nard. A protest goes up that the nard could have been sold and the money given the the poor. However Jesus defends her, leaving us with a lesson about the extravagance of the gift - there was no holding back - there was no sense of making a merely appropriate gesture. Our lives should be given, as Jesus gave His, without any holding back, with generosity - not counting the cost but appreciating the value to all. The aroma of the perfume would not only have filled the room but has come down through the years challenging us to live lives of extravagant love, reflecting the love of God. Hymn TIS 687 "God gives us a future" "Fear and doubt and habit must not hold us back: God gives us hope, and insight, and the strength we lack." An extravagance of enthusiasm, which is what we need so often, when we are feeling exhausted and flat. Offering and Prayer The prayer was that our offerings would be used by the church - wisely, extravagantly, generously. Prayers of Intercession and the Lord's Prayer. On our behalf, Rowena prayed that, as we waited and listened for God's voice, we would think of those who have loved us with extravagant love, people who gave their all on our behalf. We asked for God's blessing on those without basic living requirements, for those needing healing, hope, justice and mercy. We prayed for those we know and those unknown to us that God would look upon them in their particular need. Hymn AHB 363 "Heart and heart unite together" ..."Hallelujah! O what riches, O what height and depth of grace" God's riches overflowing in his gift of grace to us, freely given! Today Helen led us in a devotion where we considered our need for God's steadying hand and comforting, enfolding love. We're a mixed bag, but in the presence of God who loves and who forgives us we have nothing to fear. Christ calls us and welcomes us here today. With this, I felt relaxed and confident to enter into God's presence, opening up all that I am to Him. "Gather us in, the lost and forsaken; gather us in, the blind and the lame; call to us now, and we shall awaken, we shall arise at the sound of our name." And awaken and arise we did. The Opening Prayer used the physical comfort we all enjoy, wrapped up in cooler times, to allude to the comfort of being "enfolded..in (your) his unconditional love." Nothing like it. My God and King!" - No ifs, no buts. Praise him because he is! We considered our sins. Nothing world-shattering, just our pathetic weaknesses that stand in the way of God's Kingdom growing around us. We listen for your voice calling us back to you." "While I held my tongue, my bones withered away because of my groaning all day long." "Be glad, you righteous, and rejoice in the Lord; shout for joy, all who are true of heart." Scripture Reading Luke 15: 1 - 3, 11b - 32 was delivered by Joyce. The parable of the prodigal son. A story to set the listeners on their respective ears: from the son asking for his inheritance, equivalent to wishing his father dead, to that same son being welcomed back - no questions asked. Luckily the story didn't end with the son getting what he deserved because then the message to each of us wouldn't be all that comforting. I wouldn't want what I deserve. I'm looking for God's loving mercy. Then there's that other message - about others. God's loving mercy is for everyone, regardless of any judgement we might make. Reflection "Guess who's coming to dinner." Helen began by directing our attention to an inordinately large collection of "Easter Eggs" at the front of the church. She pointed out that many were, in fact, not eggs but chocolate in the shape of ducks, wombats, rabbits and hens etc. She also pointed out that she could have bought even more unusual "eggs", including a huge crocodile. At this stage she decided to take a "righteous" position, insisting that the only true Easter Egg is egg- shaped and empty, symbolizing the empty tomb. Having established this sense of a "righteous" person, she went on to introduce the story of The Prodigal Son which was Jesus' response to the 'righteous' people of the day questioning him as to why he was associating with the low-life of the place. Jesus' could have gotten himself off the hook by saying that he wasn't enjoying it all that much and was only putting up with these people to convert them - to get bums on pews in church, maybe. He told the scandalous story of a celebration thrown for a kid who had been an absolute shame and disaster. And the story of his faithful brother who was offended by the attention being given to this ne'er-do-well and who needed to be placated by the father. Our attention was directed to the father who had been watching for his son to return and when he did, forgot all the dignity of his position and lifted up his hem and ran to meet the son and embraced him. The congregation were asked for any lessons about God this story had to offer. There were many suggestions, including that God is the peacemaker, that God's forgiveness is unstinting, that God loves, extravagantly, and goes on loving. Helen related this to her own experience and said she was able to love because she is loved by God and, because of her own experience, knew the pain of giving the gift of such love. That love that Helen received is available to us all, the faithful and the unfaithful; the eggs and the non-eggs. We are all invited and treasured and loved. God wants a relationship with us. God is throwing a party. Come along and bring a neighbour. Helen then led us in a Prayer, asking that we will open our hearts and minds to the same company Jesus hung out with. There's always a temptation to think we are what we are or have what we have because we deserve it. Or to think that, for whatever reason, that we are better than "that lot". And then we thank God or his many blessings without any sense of contradiction. Hymn "There is no-one worthy of the feast" Humbling and encouraging at the same time. There is nothing we can do to deserve or contribute but "God will gladly come and bless." The Freewill Offering was taken up with the prayer that we will be instruments of compassion and reconciliation. We sat, listening to Grahame playing, putting before God our personal concerns. Then Helen and Margaret read a reflection by Walter Brueggemann called "Dreams and Nightmares" from Prayers for a Privileged People. The focus was, initially, the dreams of how God would have the world and then the nightmare of how it is. But then God's sovereignty was acknowledged and the prayer was that "our nightmares (be) less toxic and our dreams more real." In confidence, thanks was given that God would "Come among us this day; dream us toward health and peace"
After the reflection we joined in The Lord's Prayer. Hymn TIS 179 "Praise with joy the world's creator" Praise to the God of rightness, of power; the healer, the liberator, the forger of bonds and the One that holds us together in unity. and my thoughts than your thoughts." NRSV. Stephen then sang part of hymn TIS 464. "Seek, O seek the Lord"
Through this reading and hymn we were able to focus on our purpose and prepare our hearts and minds to enter into the worship that had begun and which would follow. Helen then led us in prayer to open ourselves to possibilities, waiting on God's presence. Hymn TIS 547 "Be thou my vision" In humility, we offered ourselves to God and his will for us. Scripture Reading: Luke 13: 1-9. I find this reading very difficult. Firstly, people have died gruesome deaths but Jesus declares they were no worse than others (who might have died quietly in their sleep). But then he says that without repentance we all will perish as they did and then appears to take, if not an about-turn, then a different direction, suggesting God's patience is long. I think I will sit with this. Reflection "God Gives us Time" Helen led us into the reading by providing background to the first words of the reading "At that very time" - What time? Looking back to Chapter 12, Helen referred to verse 50 in which Jesus speaks of being under stress because he knows what is ahead of him and knows his time is limited. Therefore in Chapter 13 he is telling his followers that they must be prepared too. Going back to Chapter 12 in verse 56 Jesus expresses frustration with the people present, who can interpret the weather conditions in detail but can't interpret the time they live in. Then, the message which appears only in Luke, is 'repent or perish'. This message is mediated through the account of people who died terrible deaths despite being no worse than other people, but then Jesus introduces a story about a non-fruit bearing tree which a farmer wants to uproot because it is using valuable resources. However, the gardener wins a reprieve for the tree, saying he will care for it, convincing the farmer to give the tree a little longer. Helen then reminded us of the vision of God as the God of Justice, to whom will have to give an account of ourselves but then turned our attention to him as the God of Grace. We live in a time of Grace with Jesus pleading on our behalf. We have been given the gift of Grace. We have been given the gift of Time. We are not to waste these gifts. A reminder like this one today, is always timely. On days like today, I find myself looking inward to seek out the parts of my life that are drifting off-course. Hymn TIS 129 "Amazing Grace". God's grace - our only hope and a hope that leads us where we cannot imagine. 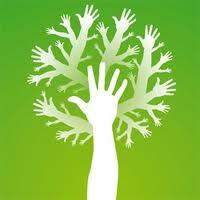 Freewill Offering We give as God gives - without holding back. Time of Confession We were given time to confess our sins and shortcomings - to look within to see what God sees. Communion Hymn TIS 685 "Lord I come to you". A plea for God's renewal in our lives, not just to experience cleansing but also wholeness that we will know peace with him. A Prayer of Thanksgiving led us into the Eucharist, praising God for his presence and our ability to know his touch. We praised him for the many ways God has provided for us to be led to him. We gave praise for Jesus' selfless sacrifice of his life and his victory which continues to work its saving power within us and in the world, and looked to him for the things to come, which are beyond our dreams. With this preparation, we stood to sing the Sanctus, aware of the import of the words. 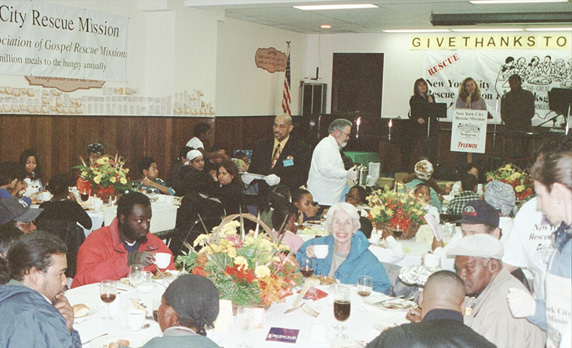 Thanks was given for the sharing of the Holy meal, signifying unity with Jesus and with each other. Theology flies out the window here, the symbols are so strong. They are given for you. Eat and drink in remembrance for me. We were then enjoined to claim the blessings offered to us through the sacrifice we were celebrating. "Glory to the Lord God Almighty! Who gives us life and lives in us. for we share together this bread and wine. The Distribution of the Communion. "We are wayfarers...to the end of the earth...to the end of the age. ...on the road to freedom...a community of grace...we travel lightly...together...our mission is love...we travel with authority...opponents of evil...heralds of hope...we travel with humility...the cross is our compass...love is our sign. When the way is uncertain, shadows are sinister, and dangers threaten, we'll not be afraid, but take heart." Behold I am with you to the end of the age. May the Road Rise to Meet You. An ancient Celtic prayer using images of nature to show how God interacts with his people. For me, I see God's hand all around me and never cease to wonder at the beauty and elegance of it all. We were sent out encouraged to do God's will and work with lightness of heart: dancing, singing, creating, risking, exploring, discovering, loving, believing, hoping, struggling and remembering. To this we replied, "We go with the assurance of your love, O God." Who else can we totally rely on 100% of the time?